Since the Patriarch could not be persuaded to agree to the Emperor’s policy, he was sent into exile and replaced by Anastasios, who shared Leo’s views; thus was the latter emboldened to make war at that time against the holy Icons. It is said that this hatred for the Icons was first suggested to him by Jews; when he was poor and was making a living from donkey-driving with them, they had foretold by sorcery that he would ascend the imperial throne. After Leo died an evil death, Constantine Copronymos, the still more savage whelp that sprang from him, succeeded him as ruler, and even more, in his maniacal opposition to the holy Icons. And what need have we to say how many and what kind of evils the iniquitous man perpetrated? When Constantine died a still more horrible death, his son, Leo the Khazar, became his successor as Emperor. When he, too, died an evil death, his consort Irene and their son Constantine inherited the Empire. Guided by the most holy Patriarch Tarasios, they convened the Seventh OEcumenical Synod, and the Church of Christ received back the holy Icons. When they ceased to rule, Nikephoros, the Logothete of the Treasury, ascended to the throne, and then his son Stavrakios; after him reigned Michael Rangabe, and they both venerated the Divine Icons. Michael was succeeded by the bestial Leo the Armenian, who, corrupted through trickery by a certain impious recluse, stirred up the second wave of Iconoclasm, and once again the Church of God was deprived of her finery. Leo was succeeded by Michael the Amorian, and he in turn by his son Theophilos, who left the other devotees of Iconoclastic madness in second place. It is said of this Theophilos, who had given many of the Holy Fathers over to outrageous torments and chastisements on account of the precious Icons, was keenly concerned about justice, that at one time he inquired whether there was anyone in the city who had harassed one of his fellow-citizens, and that, after many days had gone by, no one of this description was found. After an autocratic reign of twelve years, he succumbed to dysentery, and, when he was about to die, his mouth opened up to such an extent that his entrails were visible deep inside. The Empress Theodora was greatly distressed over this incident; no sooner had she fallen asleep, than she beheld in a dream the immaculate Theotokos, holding the pre-eternal Infant in her arms, surrounded by shining Angels, and Theophilos, her husband, being scourged and rebuked by the Angels. When she awoke, Theophilos, recovering slightly, cried out: “Woe is me, the wretched one! I am being scourged on account of the holy Icons!” The Empress immediately placed the Icon of the Theotokos on him, beseeching her with tears. As for Theophilos, although he was in such a condition, when he saw one of those standing around wearing an Enkolpion, he grabbed it and kissed it, and at once, the mouth which had insolently raged against the Icons and the throat which was lying so wantonly open returned to their natural state. Theophilos, gaining respite from the violent pain that had gripped him, fell asleep, confessing that it is a good thing to honour and venerate the holy Icons. The Empress brought out the precious and holy Icons from her coffers and made Theophilos kiss and honor them wholeheartedly. After a short while, Theophilos reposed. Recalling all who were in exile or in prisons, Theodora bade them live in freedom, and John Grammatikos, nicknamed Jannes, who was more a mantiarch and demoniarch than a Patriarch, was deposed from the Patriarchal throne. Saint Methodios, the Confessor of Christ, who had previously suffered much and been confined alive in a tomb, ascended the throne. On hearing this, they went straight to Constantinople and reported what they had been told to Patriarch Methodios and all the elect of God. After gathering together, they went to the Empress, and found her amenable in every way, for from her childhood she had been pious and God-loving. At once the Empress took out the Icon of the Theotokos that was hanging round her neck and kissed it in the sight of all, saying: “If anyone does not venerate and kiss these Icons out of love, according them relative honor, not worshipping them, and honoring them not as gods, but as Icons of their archetypes, let him be anathema.” They all rejoiced greatly. She in turn asked them to make supplication for her husband Theophilos. On seeing her faith, although they disowned Theophilos, they were nonetheless convinced. Saint Methodios assembled all the people, all the clergy, and the Hierarchs in the Great Church, and went there himself. Leading figures from Olympos, Saint Ioannikios the Great, Arsakios, and Navkratios, and also the disciples of Saint Theodore the Studite, the Confessor Theophanes the Branded, Michael Synkellos from the Holy City of Jerusalem, and very many others, made supplication to God all night long for Theophilos, all praying with tears and fervent entreaty; and they did this throughout the first week of the Fast. Empress Theodora did the same together with the women of the court and rest of the people. This being so, Empress Theodora fell asleep at dawn on Friday, and it seemed to her that she was standing beside a large Cross and that certain men were traversing the road and creating a tumult, carrying various instruments of torture; in the midst of them, the Emperor Theophilos was being led in fetters, with his hands tied behind his back. On recognizing him, she followed after those who were leading him. When they reached the Bronze Gate, she saw there a Man of magnificent appearance, seated in front of the Icon of Christ, before Whom they placed Theophilos. Grasping His feet, the Empress entreated Him on behalf of the Emperor. Opening His mouth with reluctance, He said: “Great is your faith, O Lady; know, therefore, that on account of your tears and your faith, and also on account of the supplication and entreaty of My servants and My Priests, I am granting forgiveness to your husband, Theophilos.” He then said to those who were leading him away: “Release him and hand him over to his wife.” After receiving him, she departed, rejoicing; and at once she awoke. Such was the vision of Empress Theodora. 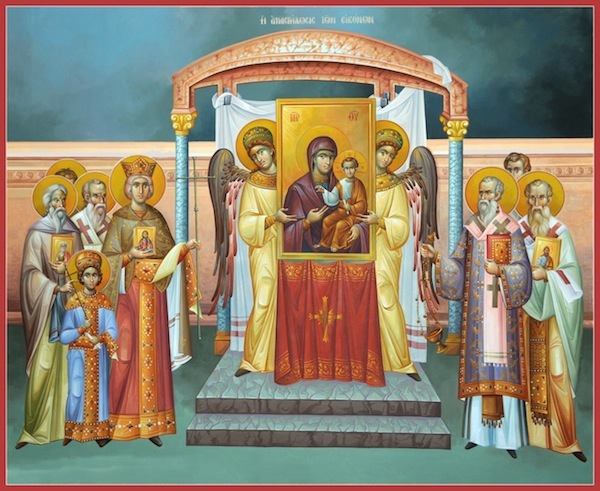 After the prayers and supplications for her husband had finished, Patriarch Methodios took a clean piece of parchment, and wrote on it the names of the heretical emperors, inserting that of Theophilos also, and placed them all beneath the Holy Table. On Friday, he, too, saw an awesome Angel entering the Great Church, who said to him: “Your entreaty has been heard, O Bishop, and Emperor Theophilos has obtained forgiveness. Henceforth, therefore, cease to trouble God about him.” Wishing to find out whether what he had seen in the vision was true, he descended from his throne. Taking the scroll, he unrolled it and—O the judgments of God!—found that the name of Theophilos had been completely erased by God. On learning of this, the Empress rejoiced exceedingly and sent a message to the Patriarch that he should assemble all the people, with Relics of the Precious Cross and holy Icons, in the Great Church, so that the adornment of the holy Icons might be restored to the Church and that the wondrous miracle might be made known to all. And indeed, almost everyone assembled in the Church with candles, and the Empress arrived with her son. Starting from there, they all processed with the holy Icons, the Relics of the Precious Cross, and the Holy Gospel, until they reached a place called Milion, crying out: “Lord, have mercy.” Thereafter, they returned to the Church and celebrated the Divine Liturgy, the holy and venerable Icons having been put back in place by the aforementioned holy men. Those who were pious and right-believing were acclaimed, while the impious enemies of the Faith, who did not accept the veneration of the holy Icons, were denounced and consigned to anathema. These holy Confessors appointed that this sacred solemnity thenceforth be celebrated annually, lest we should ever fall again into such impiety. O Thou Who art the exact Image of the Father, by the intercessions of Thy holy Confessors, have mercy on us. Amen.